A Chunky Scarf, Baxter and a C2C Throw! This little project took me only one night to complete. Granted it was knit on 9mm needles using Misti Alpaca Hand Paint Chunky yarn which is luxuriously soft as it’s a 100% baby alpaca. 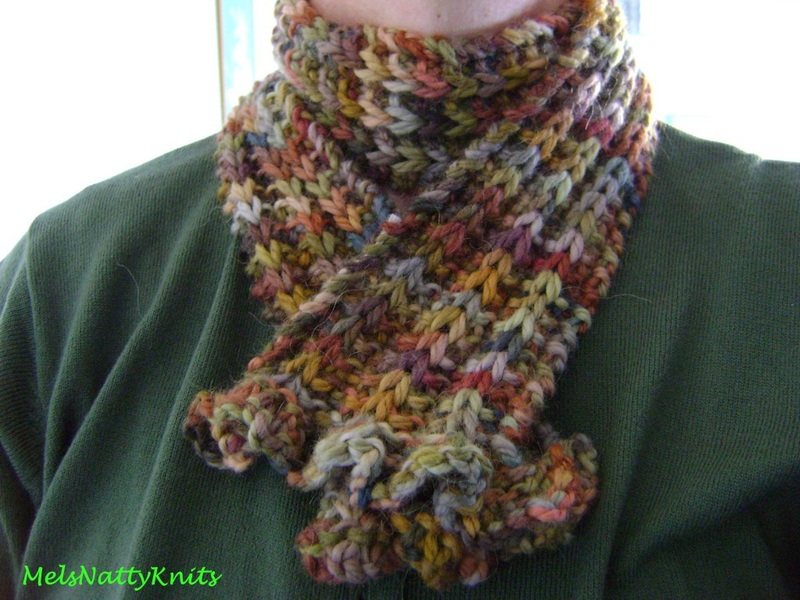 The pattern is Misti Chunky Ribs & Ruffles Scarf and has lovely ruffled ends. This scarf has certainly kept out the bitingly cold wind which I experienced not long after my arrival at Noosaville. Another little project I completed not long ago is an adorable little bear from a gorgeous book called Knitted Toy Tales: Irresistible Characters for all Ages by Laura Long and it’s the Daddy Bear pattern. This book has the cutest little characters you can knit and they are all photographed beautifully. I have called my bear ‘Baxter’. These little bears are quite easy to make especially the face as the nose section is knitted separately and then sewn onto the face. And of course Baxter had to have a bright orange I-cord to match the accent colour in my bedroom as this is where he lives. The wool used to make Baxter was spun by someone else. I just plied, washed and skeined it. 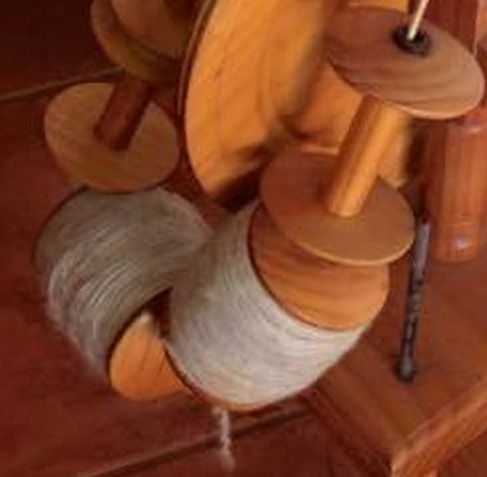 I recently bought another spinning wheel and two of the bobbins were filled to the brim with spun yarn which looked salvageable so rather than throw it away, I plied it. The yarn felt a bit coarse to be worn close to the skin so this teddy was the perfect project. He’s also stuffed with wool so he’s a 100% wool bear! 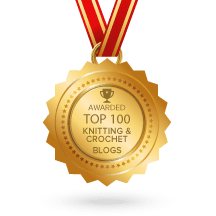 While I was at Sheep Thrills last week, I noticed a lovely crocheted throw and when I asked about it I discovered it was a corner to corner (C2C) pattern. I was instantly intrigued so the next day I sat down in front of my laptop and watched Mikey from The Crochet Crowd explain how these blankets are made. I’m using the lovely Lotus Yarns Winter Sun Aran wool I bought and I am quite pleased with my progress. Who’d have thought I’d put down my knitting for some crocheting!! 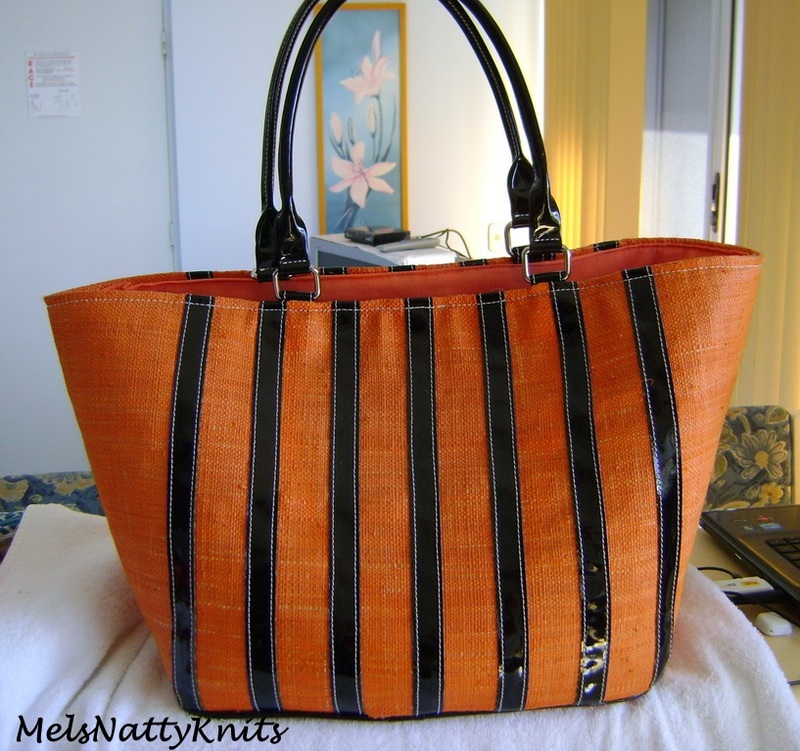 And to finish off, what do you think of this lovely large and orange carry bag I picked up at Noosaville? 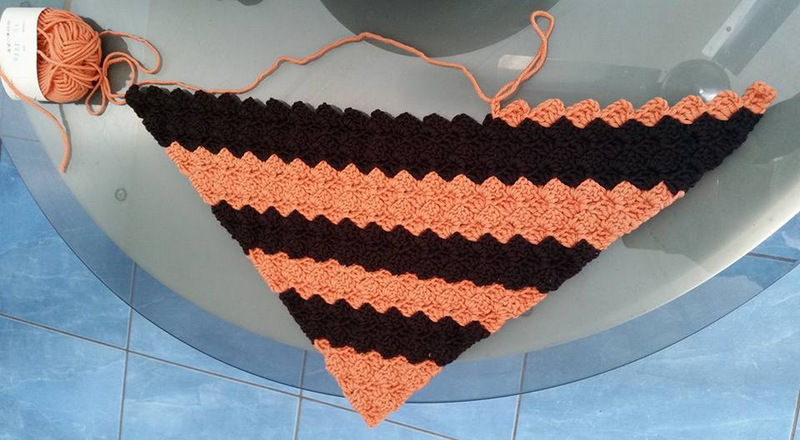 It’ll be perfect to accommodate my C2C throw as it grows larger and larger! Betty Bear is made from the softest and most luxurious alpaca yarn that I purchased in May last year from Stanmore Park Alpacas at Yatala (south of Brisbane). The weekend was an open day as part of National Alpaca Week. The yarn cost $6 for a 50g ball and I used 4mm knitting needles. 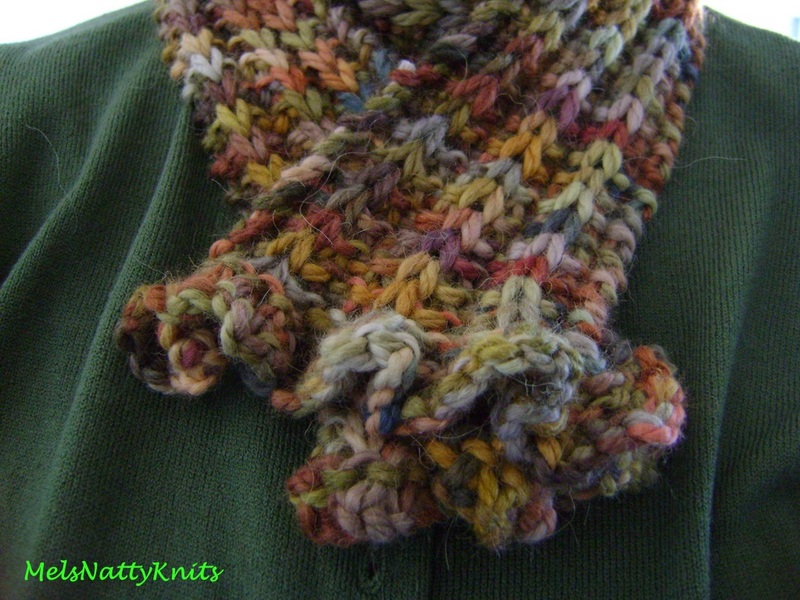 I’ll probably experiment next time with 3.75mm needles so the finished product has a tighter weave. The yarn was homespun on the premises which makes it all the more unique. 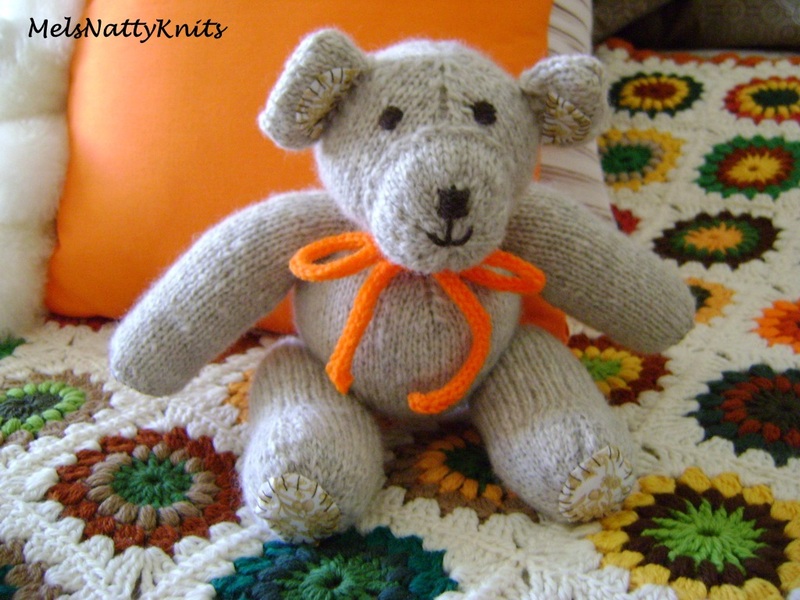 The pattern came from a gorgeous book called Knitted Toy Tales: Irresistible Characters for all Ages by Laura Long and it’s the Mummy Bear pattern. This book has the cutest little characters you can knit and they are all photographed beautifully. I have a few more I’d like to complete but finding the time is the problem! I have made one of the Mischievous Mice and once I make a couple more, I’ll feature them in a future post. This must be a picture of an earlier edition of the book. That’s the Mummy Bear on the right hand side. Laura Long also has an internet page if you’re interested in reading more. I have also just ordered her latest book Knitted Toy Travels. Can’t wait for it to arrive. The added embroidered fabric on the ears, paws and feet really adds to the character of the bear. It’s a bit fiddly to do but well worth the effort. 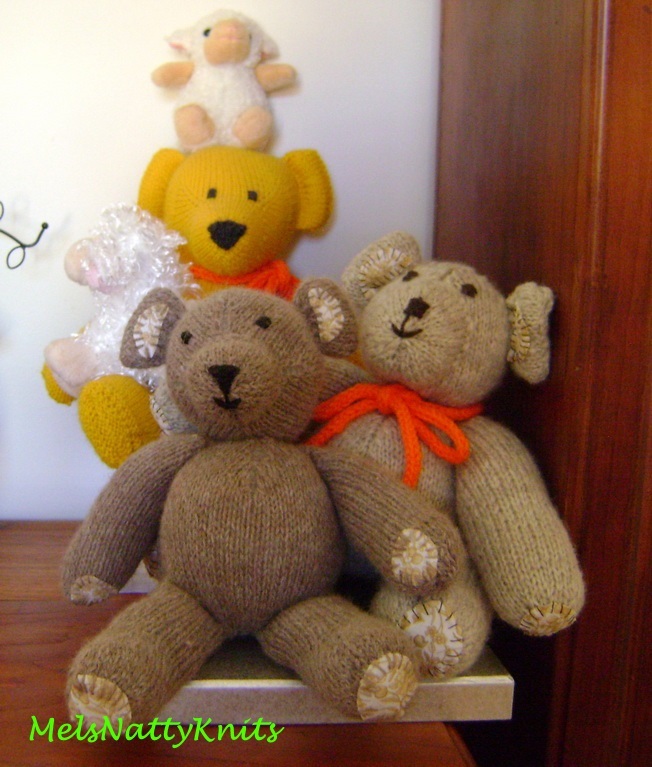 Betty Bear sits in my bedroom along with my other knitted teddy….Bartholemew Bear who is featured in a previous post. 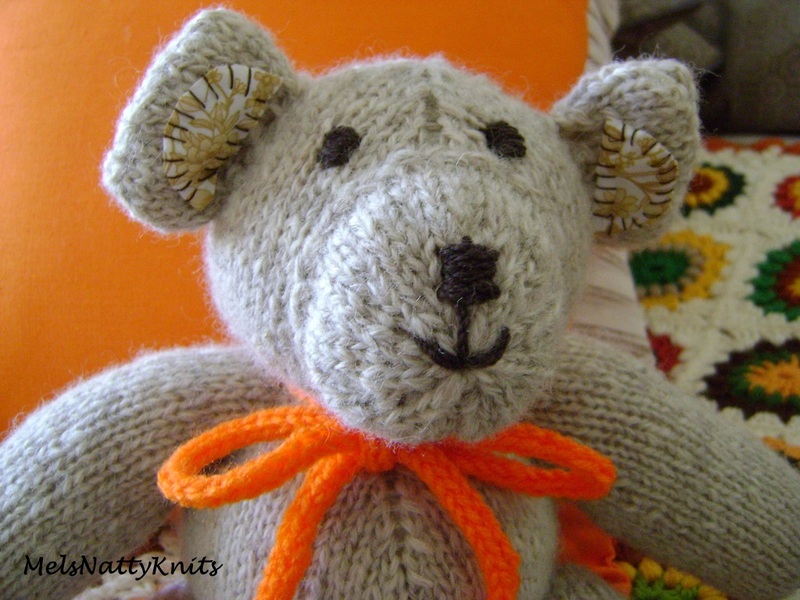 I hope Betty Bear inspires you to knit some cuddly happiness. I can’t recall ever owning a teddy bear when I was younger. I had plenty of dolls, books and puzzles but no teddy. So at the ripe old age of 54 years, I now have my very own hand knitted traditional teddy bear. Meet Bartholemew Bear. He’s made with a pattern from Jean Greenhowe’s Traditional Favourites patterns. I love this teddy as he is such a traditional looking bear. You can either stitch his legs on in the seated or standing positions. The only real challenging part of this pattern is one particular row (on the head) where nearly every second stitch is a m1 and I really struggled with this row as I had so much trouble forcing the needle through as everything got so tight. I may use a larger needle size next time on the row before the m1 row….hopefully that will provide a bit more ‘give’ in the stitches. Using a size 3mm with this yarn kept it a very closely knitted teddy bear which means you can’t see any of the stuffing which is good. All in all, I am very pleased with the results. Here’s a picture of Jean’s teddy. I think mine bears a very close resemblance, don’t you? 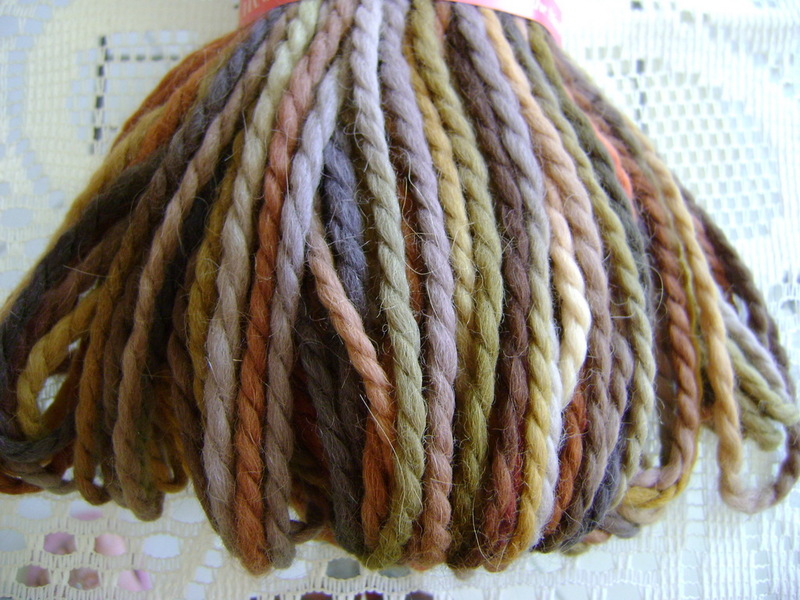 The yarn I used was Wool Importers Limited Handspun which is made in New Zealand. In Ravelry it is recorded as an Aran weight (10 ply) however it had 8 ply on my balls of wool. I knitted Bartholemew months and months ago….he just sat neglected in one of my yarn containers waiting to be constructed and stuffed. He certainly took a lot of stuffing material as the pattern calls for a firmly stuffed bear. He sure is strong and firm…..not a soft teddy at all. Here are some more pictures of my gorgeous Bartholemew Bear. While surfing the ‘net I found a picture of a traditional German teddy bear from 1954 on the Wikipedia website. Teddy hasn’t changed much over the years has he?